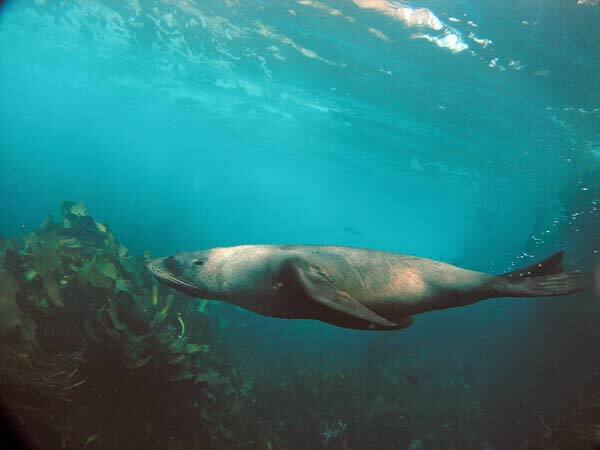 In Australia there are a number of places where you can dive with seals on a regular basis. Even in Sydney, we see seals every now and then and sometimes even see them during a dive. I have even seen them a couple of times on the wreck of the SS Tuggerah at 48 metres. In New South Wales you can dive with seals at Montugue Island off Narooma and near Jervis Bay you can see them (less guaranteed) near Wreck Bay. In Victoria they are seen around Portsea and the entrance to Port Phillip Bay, but I am not sure there is a location where you can see all year round. In Tasmania there is a location that has seals all year round. This is located at Cape Hauy. Cape Hauy is located to the south of Eaglehawk Neck (the nearest populated area and the location of the dive shop). It is to the east of Fortescue Bay, a location where you can launch a boat and camp. It is a good four to five hours walk out to Cape Hauy from Fortescue Bay and even then, you cannot get close to the seals as the cliffs are very high. From Pirates Bay boat ramp at Eaglehawk Neck, it is about 13 kilometres to Cape Hauy. This takes about 20 minutes or so. At Cape Hauy there are two islands situated one after the other and separated by about a 10 metre gap from the mainland and from the first island. The western-most gap has on the southern side two amazing structures. The first is called The Candlestick and the second The Totem Pole. The first is a huge, round rock that juts like a candlestick out of the ocean. The Totem Pole sits between The Candlestick and the mainland and is a thinner and small version. It is worth the boat trip down here just to see these. This first gap is located at 43º 08' 17.5"S 148º 00' 13.9"E. There are about 30 seals at this site. The second gap is located at 43º 08' 11.9"S 148º 00' 22.6"E (both using WGS84 as a datum). At this location there are about 40 to 50 seals and they are generally more active here. The seals are mostly New Zealand Fur Seals but there are also Australian Fur Seals. Both sites are what are called "haul out sites" which means they are all males and obviously a non-breeding site (although at least one birth has been observed in this area). If you go to the second site, anchor just off the shore in about 10 metres. You will see that the seals are generally lounging around all over the rocks, some in spots that seem very difficult to get to. Some of the younger males at times stage little "fights". Even if there are no seals in the water, once you enter, some will come in to look at you. Drop to the bottom and swim over to the shore. 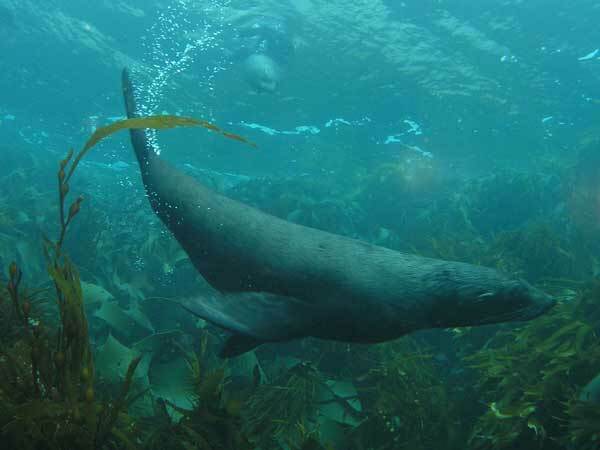 There is some very interesting kelp that comes up from about six to eight metres and lies on the surface. You can get some good photographs of the sunlight coming through the kelp. 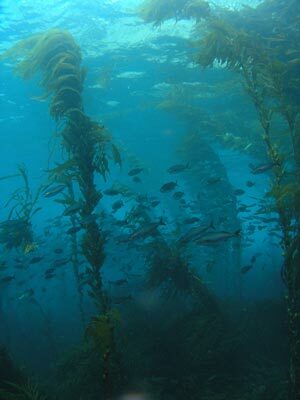 There are normally lots of small fish swimming in and out of the kelp. Go through the kelp towards the shore. It is about three metres here. You should see one or more seals on the surface. They will float around with their heads down looking at you. Gradually the seals will get a bit more inquisitive (remember, they do not get that many divers in the water with them), dropping down under the water and swimming closer. Stay where you are as they will come to you. You can try making noises through your regulator as this seems to attract their attention. I found that exhaling very quickly and making a lot of noise as you did got a couple to swim right up close. After a while change locations and see if there are any more in the water. 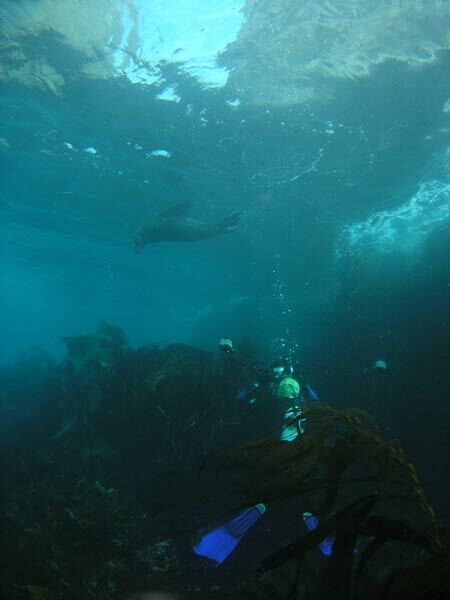 On our dive here, Kelly and I agreed to get out of the water and just after I surfaced a seal came right up to Kelly and for the next 10 minutes, she and the other divers still in the water were treated to the best encounter of the whole dive. Damn! A great experience, probably best done as a second dive after a deeper dive (say the SS Nord). Visibility was about 12 metres or so in the shallows. Water termperature in March was about 15ºC). I dived here with Eaglehawk Dive Centre and can thoroughly recommend their service.